A wireless network allows two or more computers to communicate as well as share files or Internet connection without using network cables. Your ADSL gateway has wireless capabilities that will enable you to connect computers and other mobile devices. There are a few things to configure, such as the wireless settings, before you can establish a secure wireless connection. The Service Set Identifier (SSID) or the Wireless Network Name and Channel are two of a few settings you could change on an ADSL gateway to achieve optimum wireless performance. Follow the procedure below to change these settings. 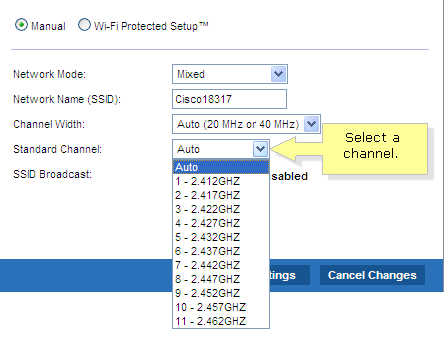 QUICKTIP: This example assumes that your Wireless Configuration is set to Manual. If you would like to configure your gateway using Wi-Fi Protected SetupTM, click here for instructions. Access the gateway’s web-based setup page. For instructions, click here. NOTE: If you are using a Mac computer to access the gateway's web-based setup page, click here. On the Setup page, click on the Wireless tab. On the Basic Wireless Settings screen, select your Network Mode. NOTE: The default Network Mode is Mixed. You can also set the Network Mode to Disabled which will disable wireless connectivity completely. This may be useful during system maintenance. 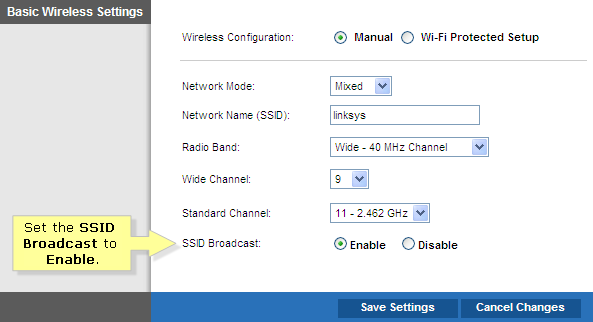 NOTE: For Linksys WAG160N and Linksys WAG300N, the only available options are Mixed and Disabled. Enter your Network Name (SSID). The default Network Name is “linksys”. It is recommended that you change the network name to something unique. NOTE: The Network Name (SSID) is shared by all devices in a wireless network. It is case-sensitive and must not exceed 32 keyboard characters in length. Select the Channel Width or Radio Band. NOTE: For best performance in a network using Wireless-B, Wireless-G and Wireless-N devices, select Auto (20 MHz or 40 MHz). For a channel width of 20 MHz, keep the default, 20 MHz only. NOTE: For best performance in a network using Wireless-N, Wireless-G, and Wireless-B devices, keep the default, Wide - 40MHz Channel. Wireless-N connections will use the 40 MHz channel, while Wireless-G and Wireless-B will still use the 20 MHz channel. For Wireless-G and Wireless-B networking only, select Standard - 20MHz Channel. Select any channel from the drop-down menu. NOTE: If you are not sure which channel to select, choose Auto. NOTE: If you selected Wide - 40MHz Channel for the Radio Band setting, then Wide Channel setting will be available for your primary Wireless-N channel. The appropriate Standard Channel option will automatically be selected. Set the SSID Broadcast to Enable. NOTE: If this feature is enabled, your Network Name will be detected by other wireless devices when they survey the local area for available wireless networks. If you do not want your network to be detected, select Disable instead.